A water-repellent treatment bonded onto the fabrIc so that rain and spills simply run off. 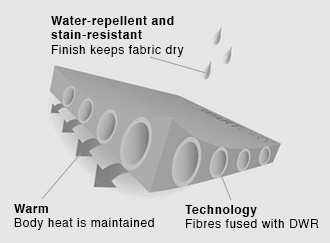 Water-repellents keep clothes drier longer, making them lighter, warmer and much more comfortable. SmartDry uses a process that bonds the molecules of the water-repellent to the surface of the garment and lasts longer than many Durable Water Repellents (DWR).